This property offers a quiet .7 mile walking loop through diverse forest and wetland ecosystems. Forest management and invasive plant species control efforts are underway, helping to preserve the abundant native plants. The spur trail offers views of Long Pond. 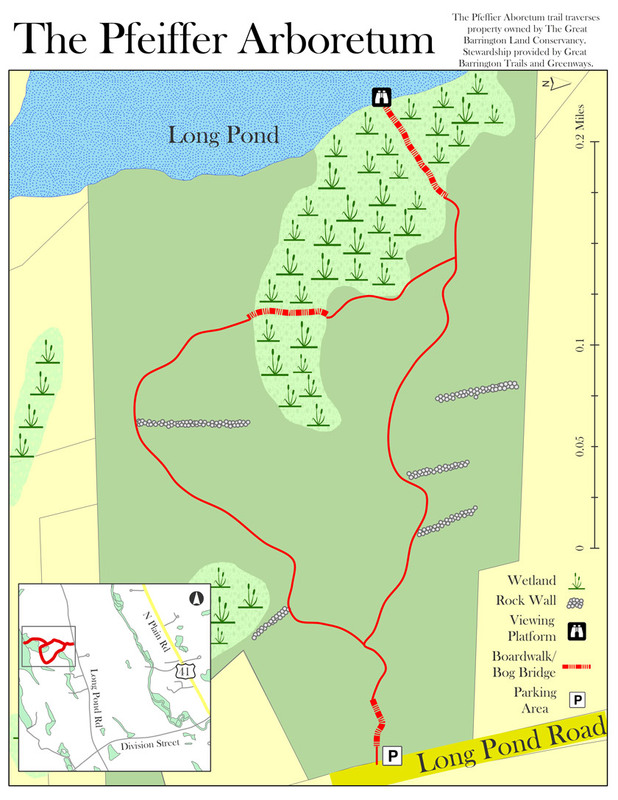 The trailhead is located at 249 Long Pond Road. From Division Street, go .6 of a mile to the trailhead. There is a sign and informational kiosk. Parking is limited. Please be considerate of our neighbors. In 2017, new bog bridges and boardwalks were installed, using black locust timber harvested from the Lake Mansfield Conservation Forest and donated by the Town of Great Barrington. This project involved 14 teens from Greenagers, 3 crew leaders and one director. Volunteers contributed 119 hours of work. Together, the volunteers and crews removed rotted walkways and installed the supports and beautiful hemlock boardwalk, stone steps and other beautiful features. Invasive species plants were removed and some new native plants were added. The project is part of GBLC's celebration of its 25 years of stewardship and has received grant funding through the MA Recreation Trail program, The Berkshire Environmental Education fund of the Berkshire Taconic Community Foundation, Housatonic Heritage and the Fields Pond Foundation. We thank these organizations for their generous grants toward this work. Volunteers for are still needed to maintain this beautiful arboretum. Please become a Friend of the Pfeiffer! Email Christine@GBLand.org to sign up to pitch in. From the center of Great Barrington, head north and follow signs to Route 41. Proceed onto Route 41 and make a left turn onto Christian Hill Road. Follow Christian Hill until Division Street, where Christian Hill, at the blinking red light at Division Street, becomes Long Pond Road. Continue .6 miles from the blinking light. Look for the Pfeiffer Arboretum sign and trailhead on the left. Parking is limited. The Pfeiffer Arboretum is at 249 Long Pond Road.